Pugs are true companion dogs. Pugs have had no other purpose than to love and be loved. For this reason Pugs are very people oriented. They not only thrive on human companionship but also need it to survive. A Pug should not be left alone for long periods of time. They do best with a companion even if it is another Pug. They love to play and go for walks. They are not aware they are small dogs so care must be taken they don’t get in harms way. Pugs are completely NAIVE (some say downright dumb) about cars. Even Pugs who have been hit by a car (and survive) do not seem to learn that cars can hurt. Pugs should NEVER be allowed loose around cars. Pugs are quite trainable with quiet patience and understanding. Do not yell and scream at your Pug. Never hit your Pug. They do best with positive reinforcement. In fact the best way to housetrain a Pug is to praise them EVERY time they do their business outside. They have such a willingness to please but they do need positive encouragement. 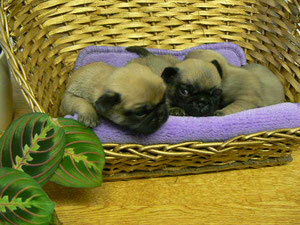 Pugs come in fawn (various shades) and black. There is little personality difference between the colours, though some say the black Pugs tend to be more active. There is also little difference in personality between males and females. Some are laid back others are more active. They all love people and will follow you and your family throughout your home. Since Pugs are shorthaired they do not need a lot of brushing. They do shed and brushing helps keep the hairs off your clothing. The nose wrinkle is the deep one just over the bridge of the nose; it needs to be cleaned with a warm damp facecloth. Ears need to be checked and cleaned. The most hated Pug grooming chore (for both Pugs and humans) is nail cutting. For some reason Pugs hate getting their nails cut. Teach your Pug early on that this is standard practice and it’s really NOT scary. Do not yell at the dog, this only makes them more scared. Some people have found that grinding the nails down with a dremmel tool is ‘less scary’ than cutting. It also reduces the chance of cutting the quick and causing the nail to bleed. It is best to have two people, one to hold the dog and a second to cut (or grind) the nails. Try doing one paw a night rather than all at once. Most agree that the Pug originated in China, dating back to around 700 BC. They were bred to be a companion not a guardian. They were bred by the royalty and were pampered and spoiled. They have not lost this characteristic. Sometimes, as a mark of great esteem,they were given to members of the court. Some interesting antidotal history (not officially verified but worth mentioning) includes an ancient Chinese law whereby only the Emperor was allowed to own a Pug. He could give a Pug to his own selected friends but otherwise it was punishable by death to have a Pug. True or not most Pugs feel quite highly about themselves and will encourage everyone and anyone to treat them like an Emperor's dog! When the Dutch discovered and started trading with China, the sailors smuggled some out and took them home to Europe where being a small dog and natural companion, they quickly became popular. Again, they attached themselves to the nobility. Pugs are great opportunists. The legend has it that when William The Silent invaded England, he took his Pug with him. One night, as the Prince lay sleeping, assassins crept up on his tent. His Pug heard them and jumped up barking, thereby saving his master. Another 'story' involves the 'love affair' between Napoleon and Josephine. It seems Josephine came part and parcel with her dearly beloved Pug. Well her Pug did not want to share a pillow with Napoleon and bit him (not a normal Pug trait but hey Napoleon was a tough guy!). Now Napoleon was not known for forgiveness and had killed man and beast for less. Well the story goes that Josephine made it clear the Pug was there to stay and if she had to choose between the Pug and Napoleon - well, there's the door Napoleon. The Pug and Napoleon worked out a truce. He conquered most of Europe but not a PUG! Pugs like any other breed require ongoing care and attention. At first glance it might seem like a lot but can actually be a rewarding bonding experience for both Pug and parent and only takes a few minutes each day. Great care must be taken with a Pugs eyes. They should be cleaned once daily preferable in the morning to remove sleep, you can use an eye wash or previously boiled water. Clean around the eyes ONLY, DO NOT put anything into the eye. ALWAYS use a DIFFERENT cloth for each eye. NEVER use same cloth for both eyes, as you could potentially cross infect. If you notice the dog squinting or any discharge at all, bathe with, cooled, previously boiled water with a pinch of salt. IF IN DOUBT SEEK PROFESSIONAL ADVICE. We always carry a tube of Golden Eye cream with us for emergency use. Some Pugs will require there ears cleaned more often than others, every Pug is different, you can use ear cleaner dispensed by your vet or use previously boiled water and a flannel. You should clean as far into the ear as possible but not past the point of entering the cavity within the head. If you are unsure you can ask your vet or veterinarian nurse to show you how it is done. As with the eyes, use a new cloth for each ear, to prevent potential cross infection. This is one of the most overlooked and undervalued area of Pug care (indeed other breeds also). A high quality dry food diet can assist with cleaning there teeth but it is still necessary to clean them using an appropriate paste. Again it is best to get your pug used to this during puppyhood but you may find that you can’t find a small enough brush, if this is a case use a little past on you little finger to apply the past and get your Pug used to being handled in this way. You should use toothpaste designed for dogs and is available in many flavors such as chicken, beef or turkey to help encourage your Pug. NEVER use HUMAN TOOTHPASTE as it is not designed to be swallowed. Regardless of how well you pug is trained, it's unlikely you'll get him/her to rinse and spit! Most people do not realise that plaque on your Pugs teeth will release harmful toxins into there digestive tract and bloodstream. This can be potentially life threatening. Also, regular cleaning will help prevent your pug from requiring a general anesthetic to have their teeth cleaned. Pugs nails grow fast and are one of the strongest materials known to man. You’ve got 3 choices here. You can start learning how to do this yourself, take your Pug someplace to have it done such as the Vets or groomers which is recommended if you are squeamish. If you’re not squeamish, and your Pug does not mind too much, you can buy a good set of clippers and do it yourself, If you accidentally cause a nail to bleed you can put some Potassium Permanganate Powder on it to seal the vein and stop the blood flow. You should only cut the very tip (curved part) cutting off just a small amount more often is probably the best way (about every two weeks). Both our dogs have above average exercise for Pugs (probably 3-4 miles a day) so once past the puppy stage and out walking you can take advantage of the 3rd option and let them wear down naturally. It is recommended you brush your Pug twice a week or as needed, this will help keep fur around the house to a minimum but more importantly keep your Pug looking good. This once again can also be enjoyable for both Pug and Parent. A soft stainless steel brush or a grooming mit should be used. You should groom in the direction of the coat. Being lapdogs a little of a high quality doggy deodorant can also be used there are a few good ones on the market that contain Aloe Vera and/or Tea Tree Oil. If you’re going to use a table to put your Pug on for brushing, make sure you hold your Pug securely, get down to their level and brush them on the floor or on your lap. Pugs like to lay in the sun, you should limit the time they spend to just a few minutes. Be careful not to exercise your Pug in hot weather, in the summer walk them either in the shade or at either end of the day when the sun is at it’s weakest. Even if a Pug doesn't show signs of heat stroke, over heating can cause damage to organs such as the kidneys, Heart and liver. If you do suspect your Pug has heatstroke, cover them in a cool damp towel, use a fan if you have one handy and give them plenty of access to water. Lastly get them to a vet. Pugs also feel the cold due to the fact they are small and therefore have a small body mass and they only have one coat unlike most dogs that have two. If you are out and about in cold weather you Pug will greatly benefit from a warm coat, fleece or hoodie. If it is raining water proof clothing should be used, your Pug should also be dried off once you are back in the dry.